Malcolm Gladwell’s book “Outliers” makes lots of interesting points, but one particularly interesting section is where he tries to tease out why Asian students outperform their white counterparts academically, especially in math. He digs into history and discusses the differences between Asian and European farming practices. He contrasts the constant attention, observation, and adjustment of cultivating rice paddies with the European (then American) process of growing grain: stick the seeds in the ground, go home, and pray that the sun and the rain show up in the right proportions. Having never cultivated a rice paddy, I’m taking Gladwell’s word (and corroborating it with what I read in “The Good Earth”) that rice takes daily tending, and the level of meticulous care given is directly reflected in the yield. I’ve also never been a grain farmer, but from seeing local farms where I grew up in New Hampshire, there were only people in the cornfields at a few points throughout the year, certainly not every day. I’ve been trying to figure out where coffee falls on Gladwell’s spectrum; is it a crop where close scrutiny and tweaking during the plants’ growth are rewarded in the harvest, or is it a crop where you say a prayer and stare hopefully at the sky? From what I’ve seen, it’s somewhere in the middle. Sowing corn, you literally drop the seeds in rows and don’t touch them until the ears are ready to come off. Maybe you add other things to the soil or spray for pests, but the plants themselves don’t need really anything else from human hands. Coffee is certainly not that independent. The seeds are sown in one place (often under the shade of banana leaves) and take 3 months to germinate. After they’ve sprouted, they’re moved to the “almácigo” (described to me by one farmer as “kindergarden”), which can be a collection of seedlings in black bags stored wherever there’s space, or a specific hillside with good soil. Once they’re big and strong enough (a year? I forget- I’ll put it on my list of questions when I go back to the farm this afternoon- if it ever stops raining…) the plants are moved to the actual cultivated rows. Once there, plants will produce for years (I’ve heard from 2-40). Clearly, cultivating coffee is more labor intensive than sowing grain. It also doesn’t follow the simple cycle of an annual grain harvest. You only have to make sure a corn stalk is healthy and strong until it produces ears; then it’s done. Because coffee bushes have longer production lives, they aren’t as “disposable” as grain, where the plant is discarded after the harvest. To grow coffee and ensure yourself a consistent annual harvest, you have to constantly have seeds germinating, seedlings growing, and mature trees producing fruit. This seems to me more like rice paddy cultivation than crossing your fingers that it’ll be sunny enough for your wheat fields. 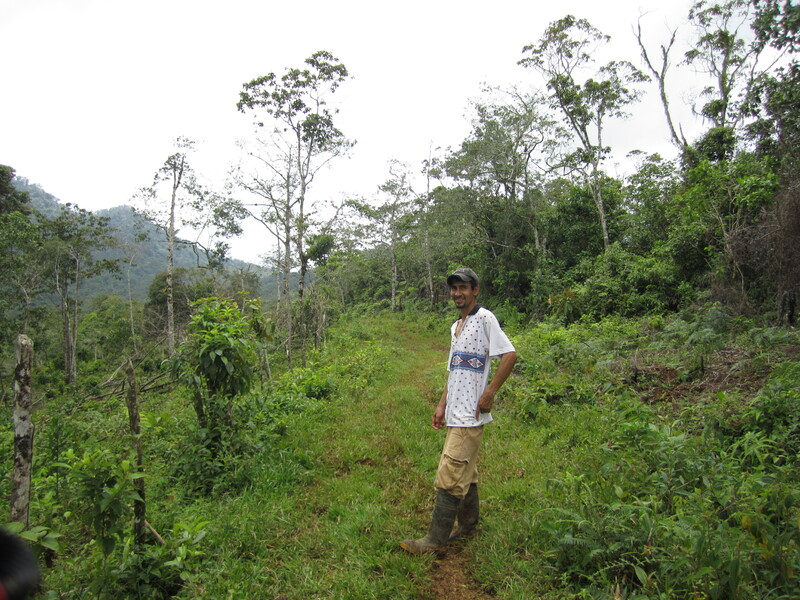 Another ICAFE article discussed the importance of scouring coffee bushes and the ground below for leftover ripe fruit after the harvest in order to control the broca. But, when you have to watch for broca depends on whether or not your plants have multiple flowerings per year and how concentrated those flowerings are, which depends on, you guessed it, variables like altitude and precipitation. Again, Gerardo echoed this when he showed me the bug borrowed inside some of the coffee cherries. He said the broca was so hard to contain because “it jumps. And it’s pretty much everywhere.” He, like all farmers in the area, used traps to lure the bugs away from the plants. According to ICAFE, traps are good, and you should have 20 per hectare. But even more important than traps is a thorough “cleaning” of the cultivated area to make sure the bugs don’t hang out in the fruit that was left on trees or the ground (because cherries with la broca certainly won’t be turned in for processing). Again, this sounds like the constant detailed labor of Gladwell’s rice paddies. But maybe that’s all high-minded administrative mumbo jumbo. One rather forcefully opinionated (and monolingual…) gringa here told me that, “these coffee growers aren’t even farmers. They just throw some fertilizer and pesticides on the plants and hope for a harvest that lets them pay their bills.” According to her, coffee farming, then, is in fact like old English grain growing; you do a lot of waiting and hoping. But if you believe the scientists at ICAFE, then coffee sounds like it requires quite a lot of attention, observation, and adjustment. It looks (literally, now that I’ve seen a few fincas) to me like it requires both the work and the hope. You can do all the meticulous work of collecting all the leftover fruit and nearly eliminate the broca, but a week of heavy rain can wash away all the fertilizer and minerals in the soil and the bushes can develop leaf rust and fall off. I am not a coffee farmer, and I have never tried to grow coffee, but I am trying to grow other stuff. Claire, another volunteer, started a greenhouse at the farm I’m working on, and I’ve joined in her experiments of trying to grow anything and everything. I’ve also been trying to grow things in an outdoor garden I liberated from stargrass and all manner of “monte” (see “slashing away at the tropics with a machete” in earlier post). As Claire’s boyfriend Ethan commented, “growing any kind of food is hard.” Claire has nurtured her tomato plants like one would small children, and some of them still died. I’ve tried planting soybeans twice, but they just won’t sprout. I’m constantly watching and trying to figure out which variables to adjust. Were the seeds to wet? Did I plant them too deep? Too late in the day? Should I germinate them in the greenhouse then move them outside? Should I plant one seed alone or in pairs? Groups of three? Obviously I’m not the first person to grow soybeans by any means (start looking at the ingredients lists in your cupboard and you’ll see just how many people-well, corporations- are growing soybeans on a massive scale), but I’m the first person to grow them here. I found a youtube video by a scientist from the University of Wisconsin explaining ideal soybean planting depths. At one point he cited the differences between planting in Nebraska and Minnesota. And here I am, trying to plant them in the wet, humid, high elevation tropics. I’m pretty much on my own. Similarly, using coffee planting parameters from Brazil, or even from the northern part of the country in Alajuela, is about as helpful as me watching that youtube video about planting soy in Wisconsin. Starting a coffee farm, even in a country infamous for coffee farming, still means that you have to execute exhaustive trial and error to figure out what works in the specific conditions exactly where you are. Coffee farms are often handed down through generations, which makes it easier for growers to really know how it works on their land. Gerardo’s father is the first in their family to own the farm where they live, and his uncle carved out the pura montaña of the adjacent land and cultivated it for coffee, so they don’t have the advantage of generations practice on their land. Gerardo went to work at the local coffee mill to learn as much as he could, so that he could help his father and uncle figure out how to grow the most- and the best- coffee. But he found that the people at the mill really didn’t know much at all about how to grow any coffee; they just knew how to sell it. They were pretty much on their own. Gladwell was considering historical Asian and European farming practices as part of his larger consideration of Asian and Caucasian standardized mathematics performance and scholastic work ethic. I’m not concerned with any broad conclusions about Hispanic/Latin American scholastic performance; in really trying to understand what it takes to make the coffee I drink and love so much I’m trying to situate the crop along the farming continuum. Part of learning is amending what you thought you knew, and I’ve already come to learn that all coffee is not in fact protected behind barbed wire and that “monte” is not a type of grass, it is any weed that you don’t want in the way of your crops. So maybe I’ll amend this later, but from what I’ve heard and seen, it seems like coffee cultivation involves all the labor and all the hope of any other types of farming.